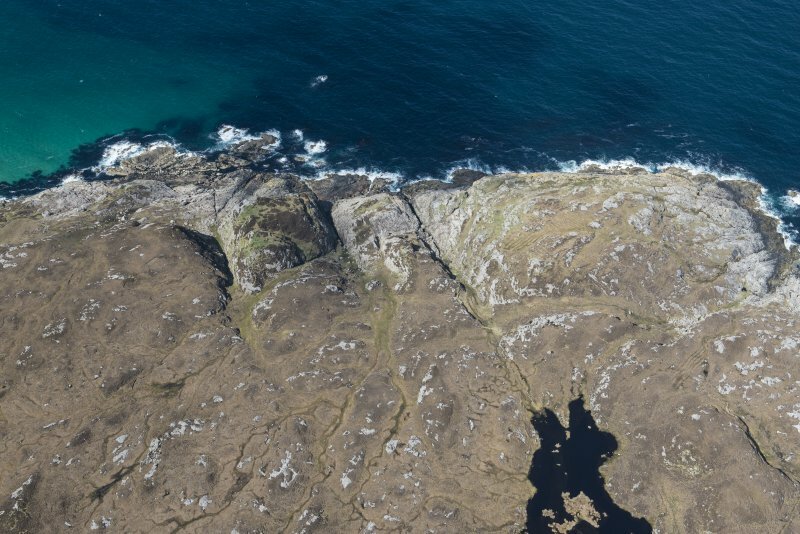 Oblique aerial view of Dun Dubh centred on the remains of a fort, taken from the NW. Oblique aerial view of Dun Dubh centred on the remains of a fort, taken from the W.
Oblique aerial view of Dun Dubh centred on the remains of a fort, taken from the WNW. 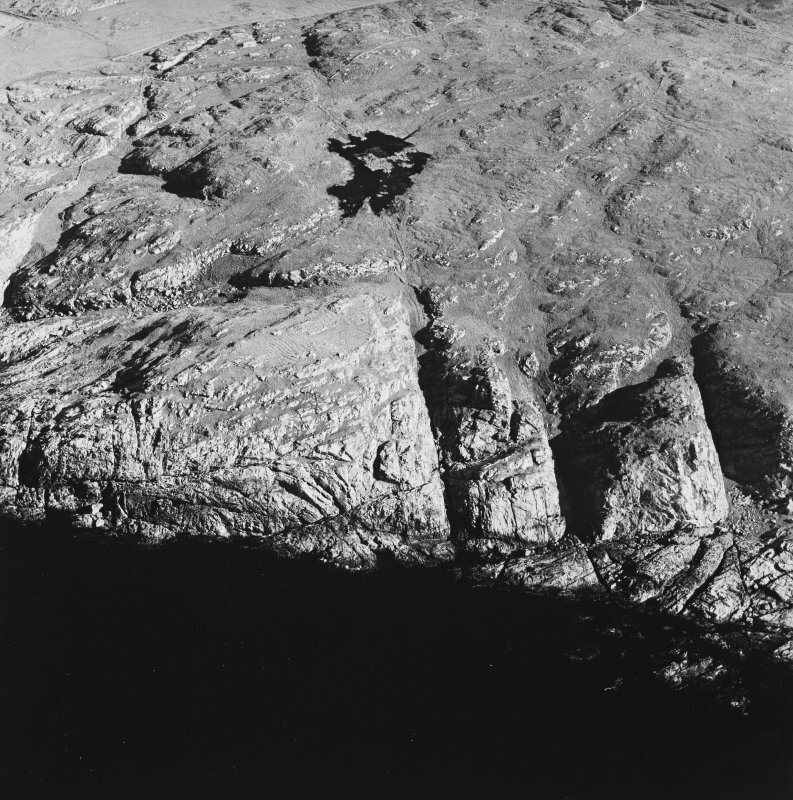 Oblique aerial view of Dun Dubh on the Isle of Coll, looking NW. 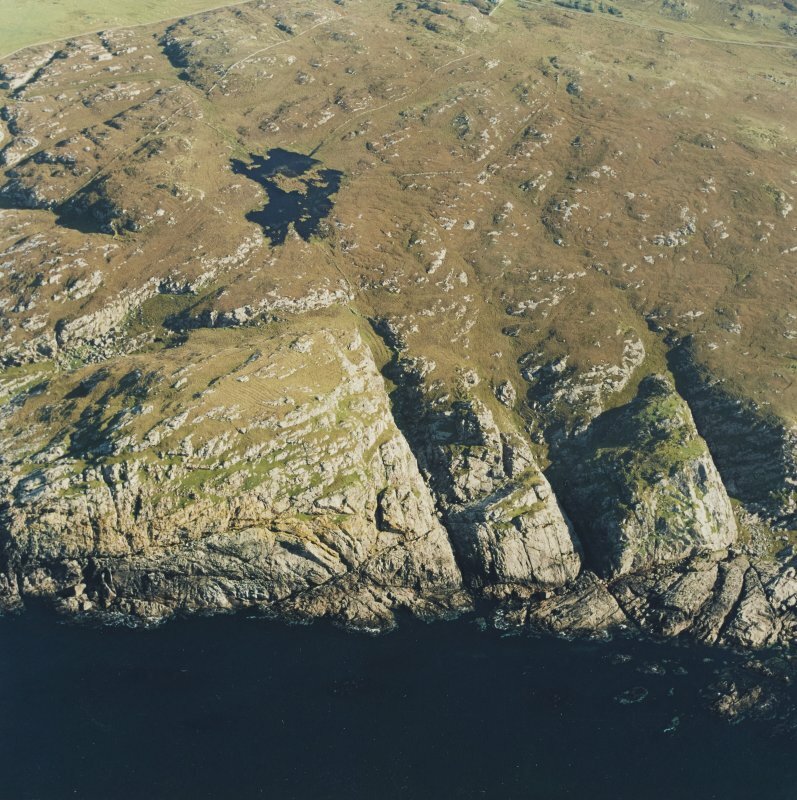 Oblique aerial view of Dun Dubh centred on the remains of a fort, taken from the SSW. 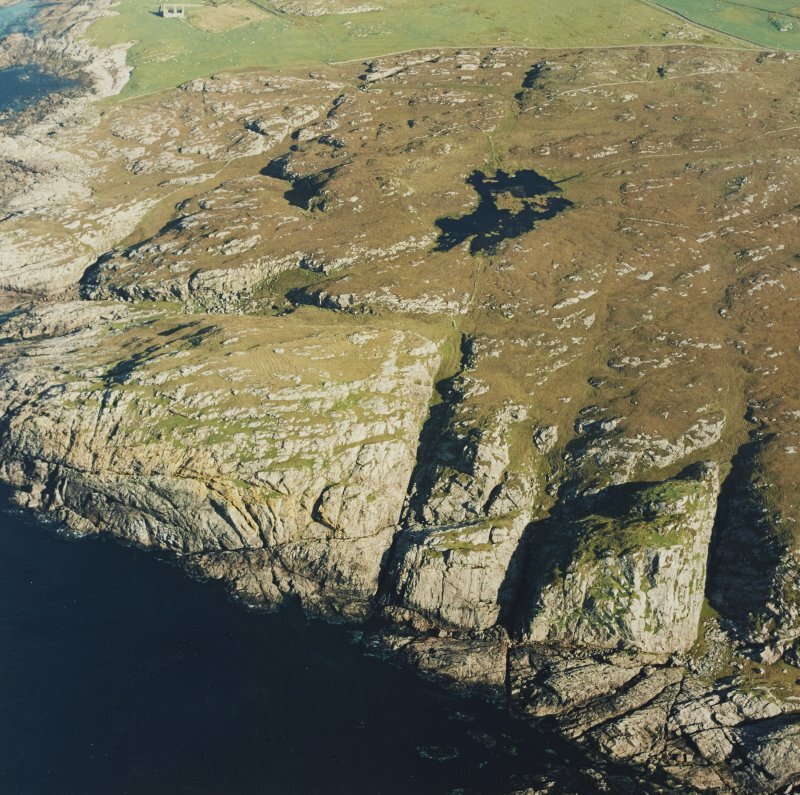 Oblique aerial view of Dun Dubh centred on the remains of a fort, taken from the ESE. 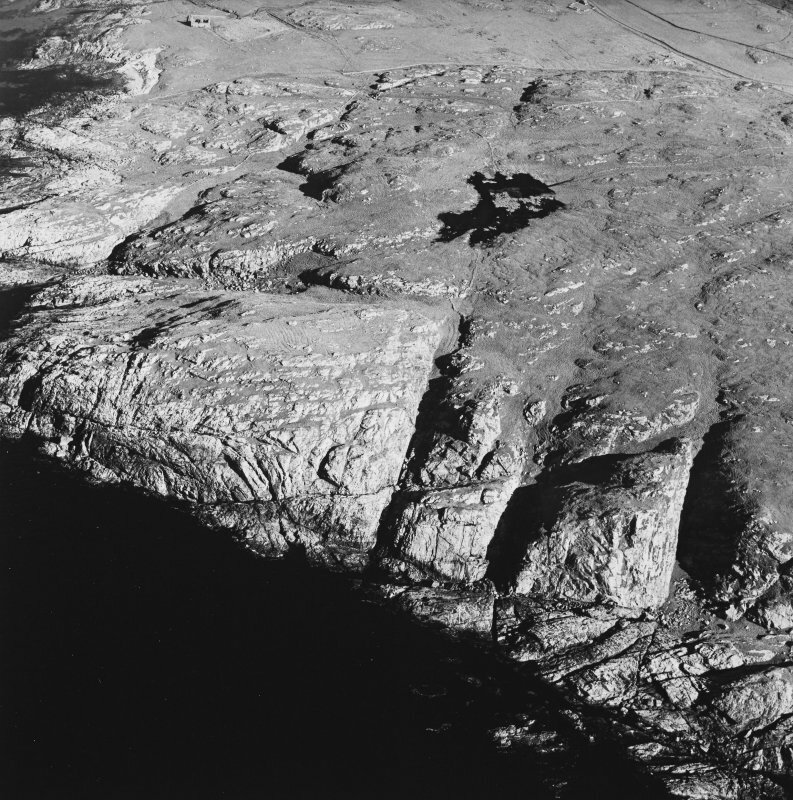 Oblique aerial view of Dun Dubh centred on the remains of a fort, taken from the WSW. Visited by OS (R L) 18 June 1972. 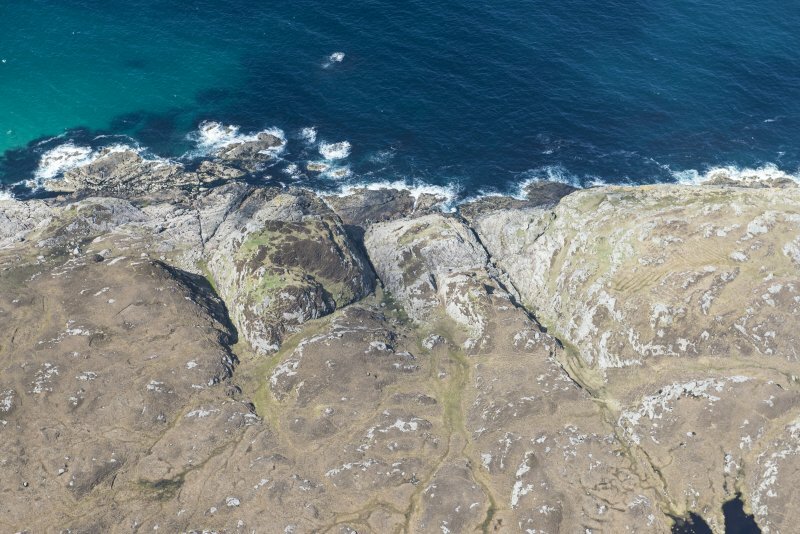 Fort, Dun Dubh: This fort occupies a detached rock ridge on the N coast of Coll 620m NNE of Clabhach. 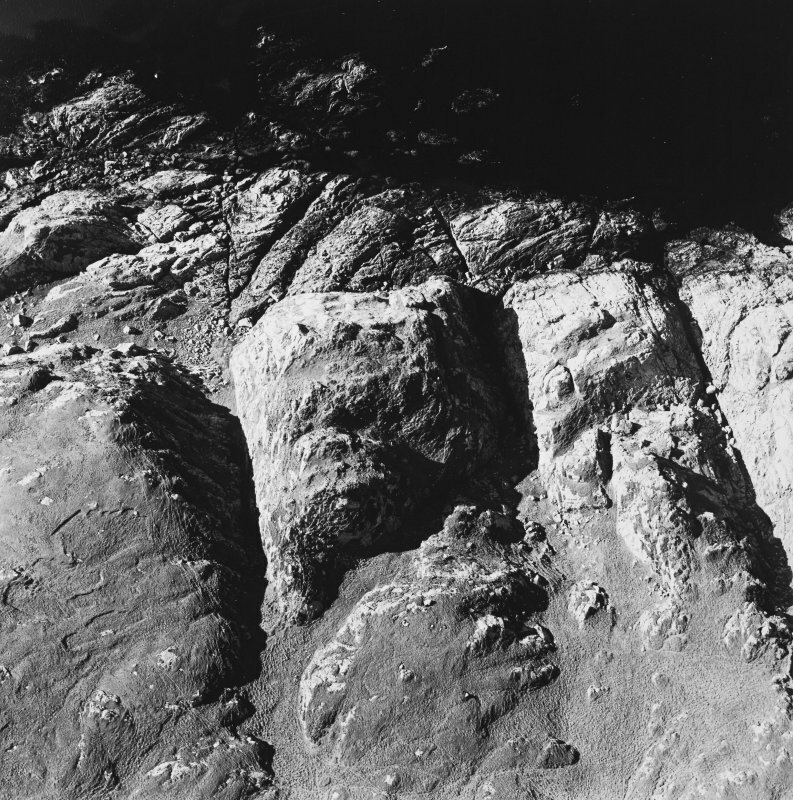 The ridge, running approximately NW and SE, comprises a high rocky boss at the SE end and, towards the NW, a series of terraces, which fall steeply to the sea on the W and have an almost vertical drop on the S. The E side of the ridge has been defended by a series of walls, of which the innermost (A on plan) runs along the crest, the wall-face standing 0.3m in two courses and the remains of the rubble core reaching a height of about 1m. The entrance has been at the S end, where part of the E side of the entrance-passage survives in situ. Two further stretches of this wall are still visible to the N and W, the former filling a cleft in the rock and standing to a height of 0.6m in three courses. 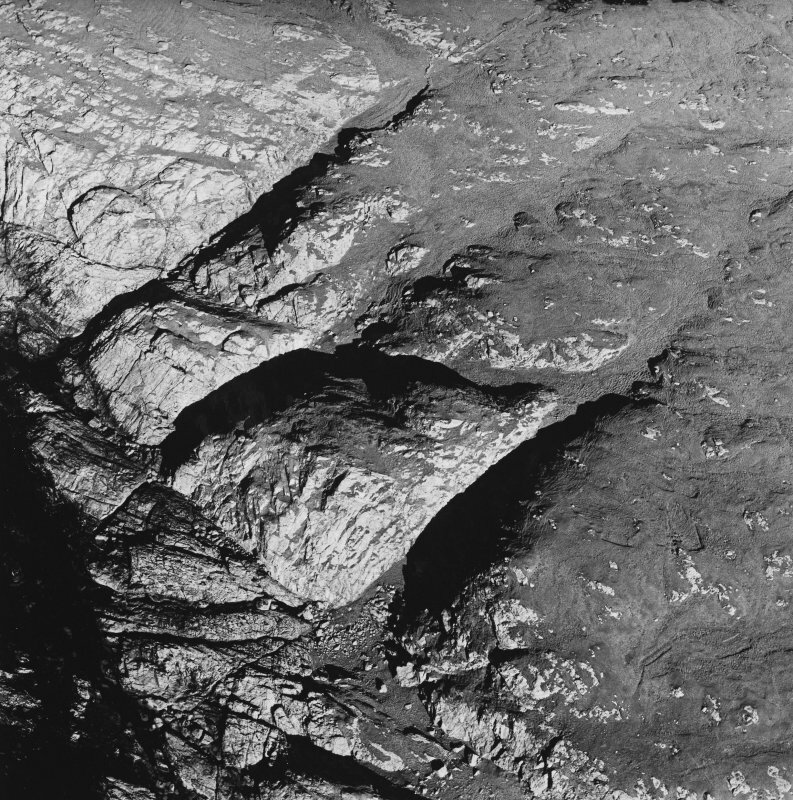 Some 2.5m down the rocky slope below wall 'A', there is an outer wall (B), standing to a height of about 1m in four irregular courses. The NE flank has been defended by a further wall (C) which, where best preserved, stands to a height of 1.2m in six courses; a short isolated stretch of this wall on the N seals a narrow gully. Just within wall 'A' there are the remains of two sub-circular stone-walled enclosures, which have been constructed out of the ruins of the fort wall; the larger measures about 4.6m by 3.7m internally within a wall, which still stands to a height of about 0.5m, but only the foundation course of the smaller enclosure survives. Beveridge notes (E Beveridge 1903) hammer-stones, fragments of coarse pottery, and small rounded pebbles found here. He also describes, in a ravine, some 30yds N of the fort, is a tiny rill, with, in its course, a heap of large stones which appears to have formed a well in connection with the fort. RCAHMS 1980, visited 1975; E Beveridge 1903. 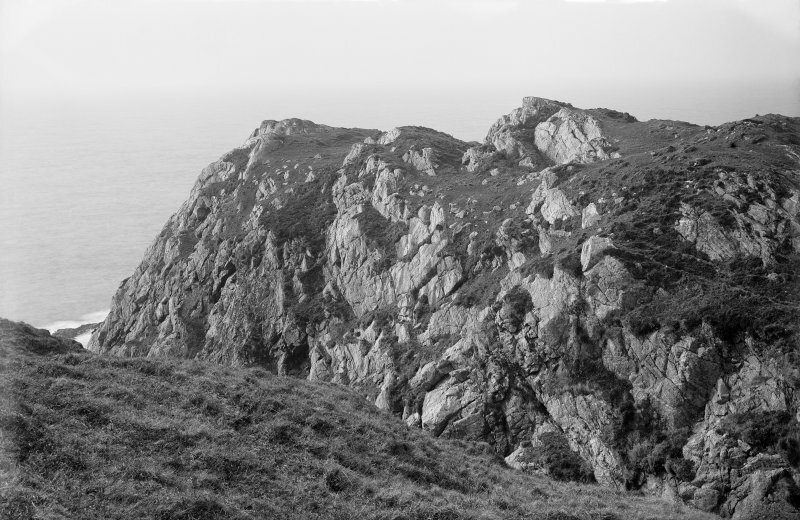 This fort on the NW coast of Coll occupies a precipitous promontory which is separated from the mainland along its NE flank by a deep gully. 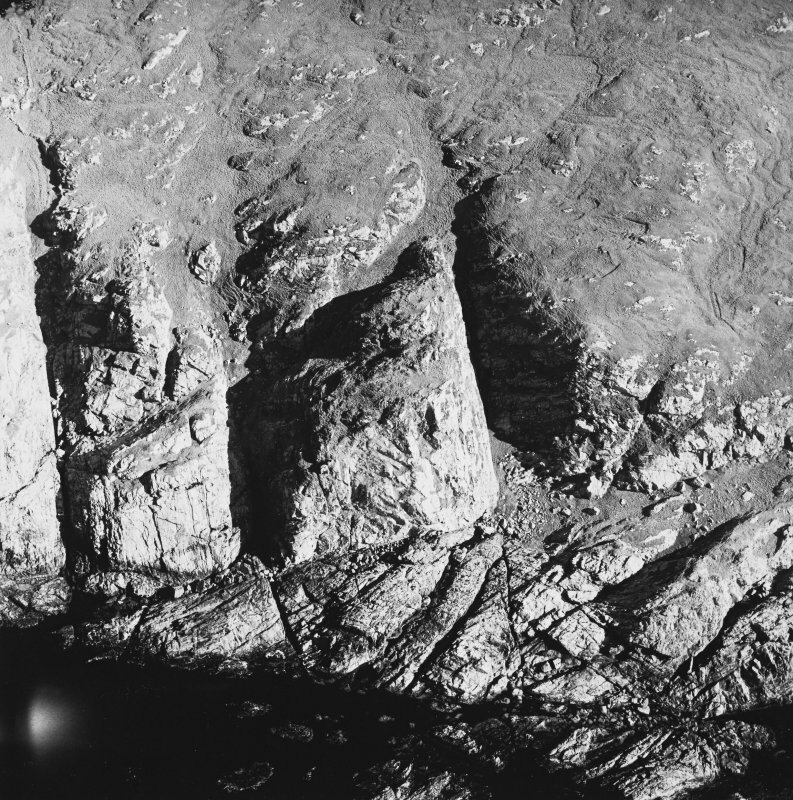 The area enclosed is roughly square, measuring about 80m across (0.6ha), taking in a rocky boss at the SE end, a steep slope dropping into the gully on the NE, and a series of rocky terraces dropping down to the sea on the NW. The main defence comprises a thick wall with a long run of the outer face visible on the crest of the boss on the SE, where there is also an entrance, beyond which there is a short length of an outer wall standing about 1m high in four courses. 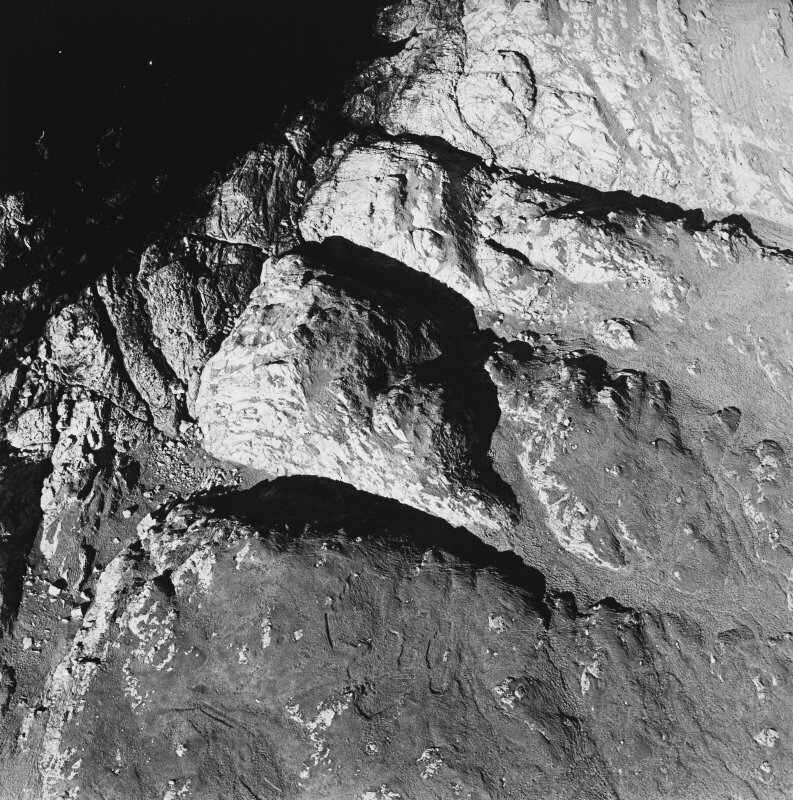 Traces of a wall are also visible along the edge of the cliff on the SW, while access from the bottom of the gully on the NE is blocked by another length of the wall set at the foot of the slope; in one place its outer face still stands 1.2m high in six courses. The only features visible within the interior are two conjoined sub-circular huts on the boss, the larger measuring about 4.6m by 3.7m within its footings, which appear to have been constructed with material robbed from the adjacent wall.